Deviled eggs for the dessert table? Sure—when they're made with your favorite JELL-O Gelatin flavor. Just top with whipped topping and sprinkles! Add boiling water to gelatin mixes in medium bowl; stir 3 min. until completely dissolved. Pour into 13x9-inch dish sprayed with cooking spray. 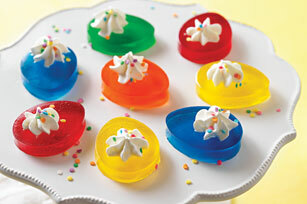 Cut into 24 egg shapes using 2-inch cookie cutter, being careful to cut all the way through gelatin to bottom of dish. Remove JIGGLERS from dish; top with COOL WHIP and sprinkles. Prepare using 2 pkg. (6 oz. each) JELL-O Gelatin. The gelatin scraps remaining in the pan after the cutouts are done can be refrigerated in a tightly covered container and then tossed with cut-up fruit for a colorful dessert the whole family is sure to love.